It is the little personal touches that make a wedding really special. We stumbled across this great idea that will encourage your guests to get creative and help set the tone of your wedding, DIY “Fill in the Blanks” RSVP cards. The wedding RSVP cards capture all of the necessary information you need to plan your day, but also encourage your guests to have some fun. Be creative with the wording and design of the cards to set the tone for your big day. Choose the most creative ones and display them near the seating plan to amuse your guests when they walk in. Alternatively, display all of them and use stickers to mark the first to reply, the funniest and the furthest travelled. You will have them forever as a wedding keepsake. 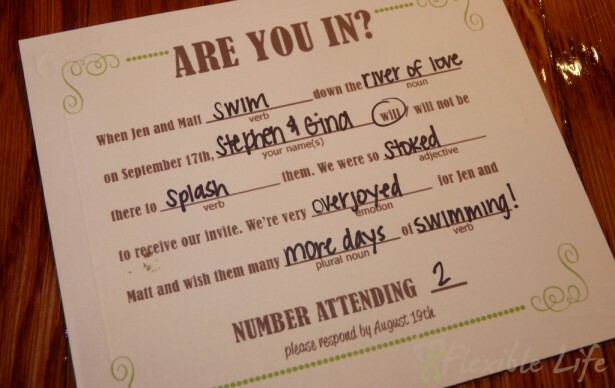 Are you planning anything similar for your RSVP cards? Please leave your comments below, we’d love to hear from you.